As the first 24 starting spots for the Indianapolis Motor Speedway’s most prestigious race were locked in during Saturday’s Pole Day, Sunday put drivers and teams otherwise not secured in the field into position to gain one of the last 9 spots the Memorial Day weekend running of the Indianapolis 500. A day long known as Bump Day as it was the session where cars would often compete to make or miss the Indy 500 field. For 2012, the face only 33 cars and drivers were fighting to make the race meant there was no actual bumping this year. 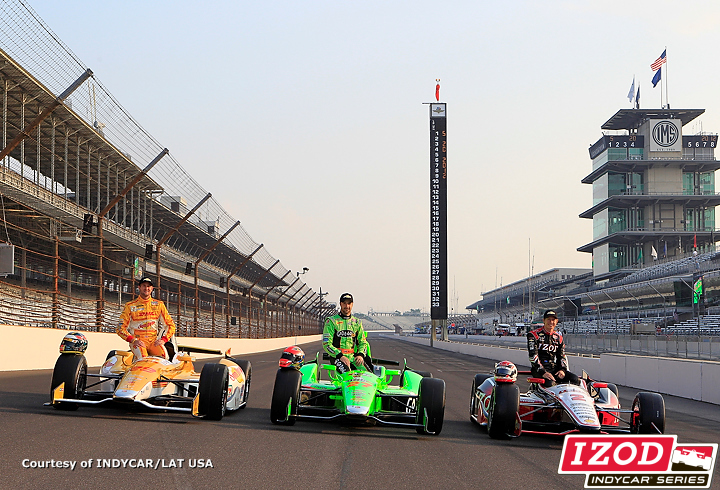 There was several drivers posting new time qualifying efforts to better their starting position in the 2012 Indy 500. First out on the 2.5-mile oval racetrack was the #78 HVM Racing car of Simona de Silvestro. In the four-lap run, de Silvestro posted a 214.393-mile per hour average speed. One of only two Lotus powered race vehicles qualifying for the 2012 edition of the Indianapolis 500, the #78 starts second-to-last alongside Jean Alesi’s #64 car. Alesi’s average qualifying effort is 16.4 miles per hour slower than the pole speed. A four-lap speed of 210.094 miles per hour, Alesi at 47 years of age enters the 2012 Indy 500 as the oldest driver to compete for rookie honours. On the other side of the speed coin, the Dragon Racing cars of Sebastien Bourdais and Katherine Legge made some great progress in finding qualifying pace other only receiving their Chevrolet engines midway through last week. Katherine Legge posted a respectable average speed over the 220-range while her teammate did even better. Driving the #7 race car for Dragon Racing, Bourdais posted a stunning 223.760 mile per hour four-lap average. One day earlier, that speed would have been good enough for 15th on the starting grid. However, based on the limitation of Bump Day, Sebastien Bourdais will start 25th ahead of Wade Cunningham. Cunningham and teammate Mike Conway gained their spots through Bump Day after difficulties in day before where the #14 car’s time was disallowed when the Dallara DW12 failed inspection. At 1:15 pm, Bryan Clauson driving a second Sarah Fishing Hartman Racing car hustled into the 2012 Indy 500 with a 214.455-mile per hour effort. With 32 cars recording times, the last remaining car needing to time into the field was the #20 car of Ed Carpenter. Carpenter needed to set a time on track following a crash on Pole Day. Little past 2 pm, Ed Carpenter (driving a back-up car that was feverishly built in order to make the Indy 500) was the last driver to post a time on Bump Day at Indianapolis Motor Speed. The 33rd car that filled the Indianapolis 500 field, the four-lap speed of 222.324 miles per hour of the #20 race car was the final qualifying run posted on the race track. After almost four additional hours, the 33-car field of the 2012 Indianapolis 500 was cemented. On May 27th, the 96th Indianapolis 500 will start with Ryan Briscoe leading the three-wide parade to the green flag on Memorial Day Sunday. Thank you for this nice article. I have book marked this website because I really hope you write more articles soon, I plan to share this. Exciting!! !Let me share a surprise that can take you a good mood,they sell rolex atlanta,Cheap, fashionable.